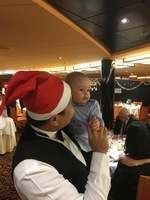 Recently returned from ten days on board this ship for Christmas around the Med. This was by far the worse ship and the worse cruise we have ever been on. This was our second MSC cruise and what a total letdown. Firstly I’ll start by saying the ship was at least clean.After that the positives end unfortunately. It’s a very basic ship with extremely limited options in regards to food,drink and entertainment.So if you one of these people that enjoy poor food poor entertainment and very poor service you will love this ship. The buffet is way too small for the size of the ship and most days there are que outside at peak times.They have tried to increase the size of the seating area by offering seats on the deck in a patio heater style seating area.This is ok in summer but not in winter and eating food off plastic plates under patio heaters isn’t my idea of fun.The choice of food at The buffet was “same old” most days and again very basic. The restaurant was a slightly better environment but being forced to sit with people even after asking to be moved three times again isn’t my idea of fun.Food was again poor. Moving onto entertainment (or lack of). There are 5 bars in total with only the Irish pub offering anything in the way of entertainment before 11pm.This consists of an Italian guitar player playing a very limited song book in very limited English.He also has to stop playing every half hour or so because they could “hear him in the theatre “ even though we could never hear the theatre. It all got very frustrating leaving people sat there with no music and zero entertainment. As for the other bars,well the Budda bar was shut most times when we walked through although we did get a drink there one night and they had a guy playing piano for a while. The main bar (Manhattan) is a strange concept. Yoga and stretch classes are the main entertainment every night before dinner. Yes you did read that right!!! The musical duo who were supposed to start at 6pm usually rolled up bout 6.15 and played a couple of iffy Spanish/Italian/French songs.The “main” entertainment then began around 11pm in this bar. Ranging from a few game show things to some music. Our main highlights consisted of seeing how long it took to get served every night in each bar. This ranged from a few mins to 39 mins which was the longest it took.We ended up changing their tile from waiters to sales prevention staff because they would do everything they could NOT to serve you. So when I decided to complain feeling I had been short changed the bar manager informed me the ship was at full capacity with Strongbow (all very confusing) still the sales prevention staff kept telling me they had none.Then to my delight I was informed they had draught Strongbow in one bar.What a blatant lie,it was some sort of cider in a box but most certainly NOT Strongbow!!!! I could go on about various other faults and cost cutting areas but I think you get the picture. Very basic and very dated.